Besides pristine beaches and lush tropical rainforests, Costa Rica also has many spectacular waterfalls! Waterfalls in Costa Rica are amazing because you can not only take gorgeous photos and spot wildlife, but go hiking, swimming, horseback riding and waterfall rappelling! Visiting waterfalls makes a great day trip; pack your sunscreen, swimsuit and picnic lunch and get ready to get lost in the among the tropical flora and fauna and spend an entire day relaxing beneath a rushing waterfall. With thousands of waterfalls to see throughout the country, it can be hard to chose which ones are the best. Not to worry however, because we’ve made it easy for you! Keep reading to discover Costa Rica’s top ten waterfalls. Don’t miss these incredible waterfalls on your next trip to Costa Rica! La Paz Waterfall Garden is located in the central part of Costa Rica very near to the Poas Volcano and thirty kilometers north of Alajuela. Visiting the La Paz waterfall is a great day trip to make from San Jose. It is known to locals as Catarata de La Paz, meaning The Waterfall of Peace. La Paz is 37 meters tall (121 feet) and is fed from the La Paz River to maintain the steady flow of water over the falls. This waterfall and surrounding trails are very well taken care of, making it an ideal location for families who want easy-moderate hiking. You can also admire many birds and butterflies in the surrounding gardens. 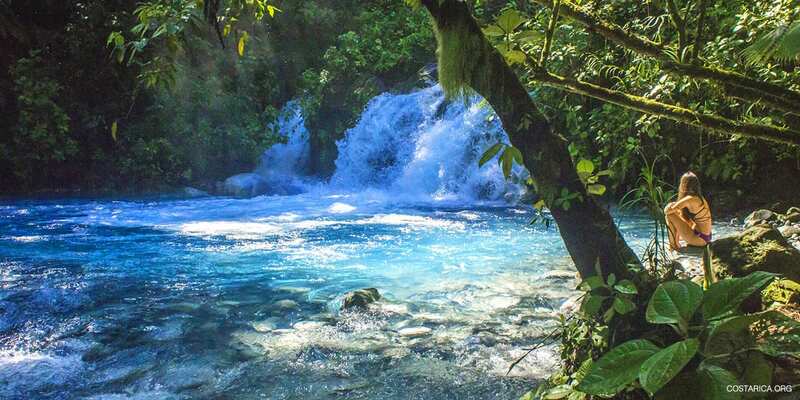 Rio Celeste is well known for it brilliant blue waters, making it a famous attraction in Costa Rica. The blue water comes from a mix of volcanic rock within the water and it’s almost impossible to capture how luminescent the water really is in a photo. Seeing it first hand is the only way to truly admire the waterfall. The falls drop down 30 meters (100 feet) into the vibrant sky blue pool. Moreover, there are trails all throughout Tenorio Volcano National Park that are highly maintained. The Rio Celeste Waterfall is located not far from the small town of Katira. One of the most well-known waterfalls in Costa Rica is the La Fortuna Waterfall, close to the nearby town. La Fortuna Waterfall is also very near the Arenal Volcano and Cerro Chato. The falls itself branches off of the La Fortuna river and then has a sudden drop of 75 meters (250 feet) in the middle of the jungle. Hiking down La Fortuna is a task in itself but well worth the walk to swim in the river below. The entrance to the waterfall is easily reachable by car. Nauyaca is astonishing because it has a spectacular two level drop. The first one is 45 meters high (150 feet) and then it comes to another fall of 20 meters (65 feet) totaling 65 meters (200 feet). This is by far the best waterfall for swimming. Nauyaca has a huge 100 square meter (1000 square feet) pool at the bottom of the falls. Swimming here is an unforgettable experience but be aware that the pool is up to 6 meters (20 feet) deep! Llanos de Cortez may be one of the smaller waterfalls in Costa Rica but its one of the most beautiful. The Falls are 20 meters (65 feet) tall and they have long divided wisps of water coming down the cliff. Llanos de Cortez is located in the town of Bagaces in the Guanacaste province. You can reach the waterfalls in just half an hour from the airport in Liberia. Another draw is that you only have to walk 10 minutes from the parking lot to get to Llanos de Cortez which makes it easily accessible for almost everybody. The Diamante Falls are the tallest waterfalls in Costa Rica with 200 meters (600 feet) in height. Even though they are very tall and spectacular, the Diamante Falls are rather unknown because they are a quiet hard to find. They are located in the small town of Las Tumbas, a 35-minute drive from Dominical. You can look at the falls on the family owned property, but we recommend taking a guide tour to get there. The hike is for more experience hikers and considered fairly advanced. Bajos del Toro is yet another amazing site is located in the province of Alajuela, in the remote mountains north of the Central Valley. The water from the insane waterfall comes from the Poas Volcano. As the water falls over the rock edge, a beautiful mist surrounds the waterfall. You will see plants that are torched because of the volcanic water. The waterfall is surrounded by primary forest which makes it easy to spot a variety of wildlife. Bajos del Toro is 90 meters tall (300 feet) making it one of the making it one of the tallest Costa Rica waterfalls. The San Luis waterfall is simply extraordinary and perfect for those that like to trek through the tropical rainforest. The walk to the waterfall takes roughly three hours but it is totally worth it. If the hike doesn’t leave you breathless the falls surely will. San Luis is shrouded with rainforest and endless amounts of animals not far from the Monteverde Cloud Forest. Keep an eye out for monkeys, sloths and exotic tropical birds! The San Luis waterfall is 100 meters tall (300 feet). Montezuma is another multi-level water fall. It consists of three levels, each one bigger than the last. The first is five meters high and has a beautiful little pool to swim in. You have to swim across the first pool and then come to a 12-meter drop to access the second falls. The last drop is the most amazing with a height of 25 meters. The Montezuma waterfalls are 40 meters (130 feet) high in total. At the bottom, you can see many locals swimming in the big pool. It is located on the Pacific coast near the town of Montezuma and right beside the Nicoya Peninsula. Los Chorros is indeed the most accessible waterfall in Costa Rica. It is very close to Juan Santamaria Airport and just north of Grecia. Los Chorros also offers some very cool activities, including waterfall repelling. You’ll have a blast repelling down the face of the falls, which are roughly 45 meters high (150 feet). Just imagine the thrill of climbing down such a tall waterfall! The literal translation of Los Chorros is The Jets, coming from all the small but mighty rivers along the mountain side. 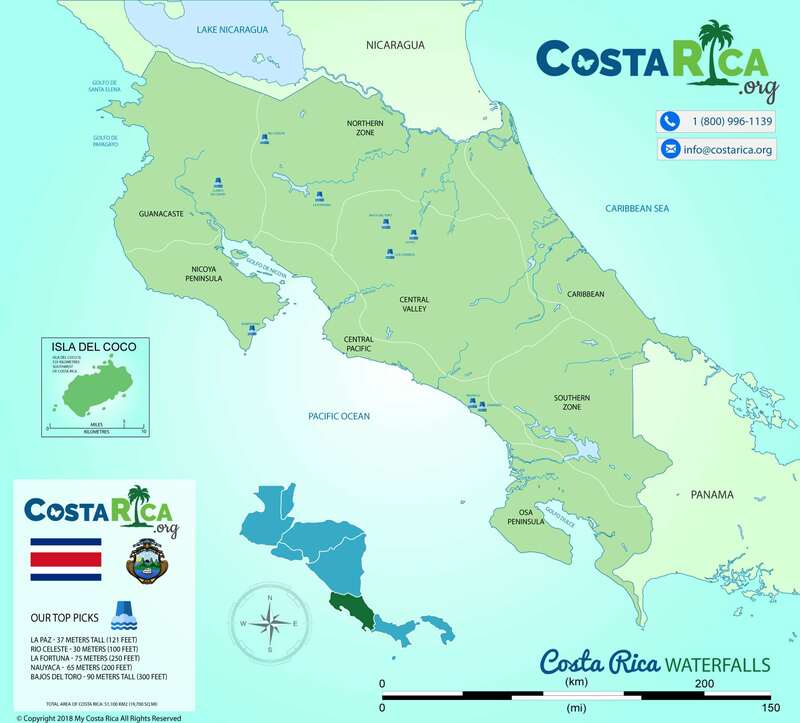 Now that you’ve read about the top ten waterfalls in Costa Rica, check out where they are on the map! And remember to always think about your personal safety when visiting the waterfalls. Never cliff jump unless a certified tour guide says it is safe and always check to make sure the water is safe to swim in. During the rainy season the water levels can reach dangerous heights. Try to plan your visit during the dry season!